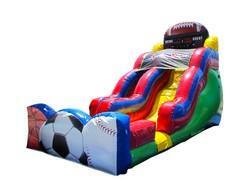 Score big with sports fans with the super Sports Inflatable Slide. Featuring basketball, soccer, baseball and football, your sports-loving guests will get a big kick out of this slide. With its colorful red, blue and green sides and bright yellow slide, this playful water slide will be a home run at your next party or event.